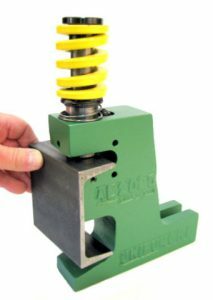 The “AE” unit is specifically designed for 3” (4.1#) and 4” (5.4#) structural channels, however, the large cutaway section permits the perforating of a large variety of I beams, angles, special shapes, and extrusions. The angle die, part number 2090 has die face angled to accommodate the flange of the channel. Flat dies are available for non-structural parts. Custom “AE” style units are available for larger channels, irregular shapes or extrusions. Click here for more information. Request a quote today!